I was asked to take part in this months neon themed Style Compare challenge. I don't really get too involved with blogger challenges, I feel as someone who has a fair ammount of followers I have a bit of a unfair advantage, and I like to see other people get a chance to win. However the theme fits so well with my recent love for Neon I just couldn't say no. After much deliberation I ended up picking a neon yellow/greenish jumper from Topshop and paired it with my much loved Primark pleather skirt and a shirt under it. The nails are a bit much, but I can't get enough the Models Own x HedKandi collection so I just had to use Beach Party on my nails. You can vote for me on the Style Compare page, If I win I get a voucher and I get one to share with you guys too. However if any of the other bloggers involved take your fancy go ahead and vote for them, there are some great entries for this Style Challenge! that nail colour is brilliant! You are such a cutie in neon! Such a colourful outfit, love it! 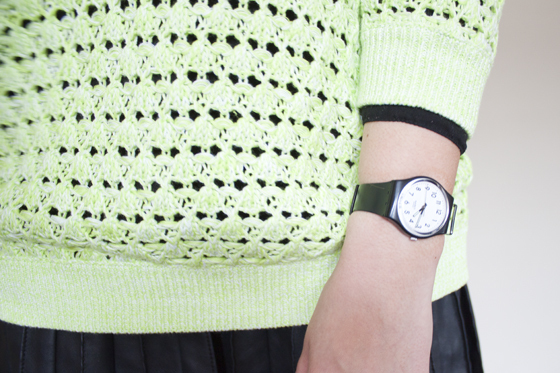 I love this neon jumper ! The neon looks great paired with the black! Love the jumper, the colour is really nice! Great outfit for the competition!It suited the neon theme perfectly. I wish you the best of luck! You carry off neon so well! I'm still lusting after your coral neon jumper. I love your jumper! It's neon but still soft and feminine. Hope you win the challenge! really love this outfit of yours! not really into neon but it works really well in this outfit! LOVE this colour nail varnish! Really love the top and nails! LOVE the jumper, just ordered some neon skinny jeans in a similar colour actually!